Add-on item only! A single pair of size LARGE SlingRings, for DIY sling sewing. 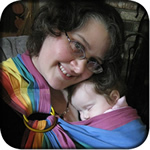 Please order from SlingRings if all you need is a pair of rings -- this is solely an add-on if you are also buying a ring sling. However, as it says above, I am not a reseller of SlingRings, and I don't want to become one. If you are buying a sling and need more than two pairs or rings, and/or you are not ordering a sling from me, please go to SlingRings.com and buy them. If you order nothing but rings from me, I will cancel and refund your order.